Rack and Panel Mount display units feature a front mounting bezel with through holes or captive hardware for customer installation. The mounting bezel of Rack Mount units conform to rigid ANSI/EIA/RETMA industry standards in width: 19” or 24”, height: specified in 1.75” (1U) increments, and the mounting hole locations which are limited to the two sides of the bezel in a prescribed spacing pattern. Panel Mount units satisfy customer requirements but do not meet industry Rack Mount standards. Displays feature a metal or composite bezel designed to ANSI/EIA standards for fixed installation on the mounting rails of standard 19” equipment racks and transit cases. Door Mount units employ a unique mounting bracket designed to secure the Door Unit to the outside front face of the equipment enclosure instead of to the underlying mounting rails, freeing the rails for other electronics. The bracket design permits the Door Unit to be hinged open to reveal the electronics mounted behind. RF-27 and RF-30 were selected for the USAF Joint-STARS program. The RF-27 is presently being deployed throughout the JSTARS fleet where it serves as the main operator console video display. RF-27 and new PM-27 were chosen for the USN P8 Poseidon program. RF and PM units are deployed on the E-2C Hawkeye, P-3 Orion, EP-3 Aries, AC-130 Gunship and C-130 Hercules aircraft. DM models have been deployed for over ten years in Predator Ground Control Stations worldwide. 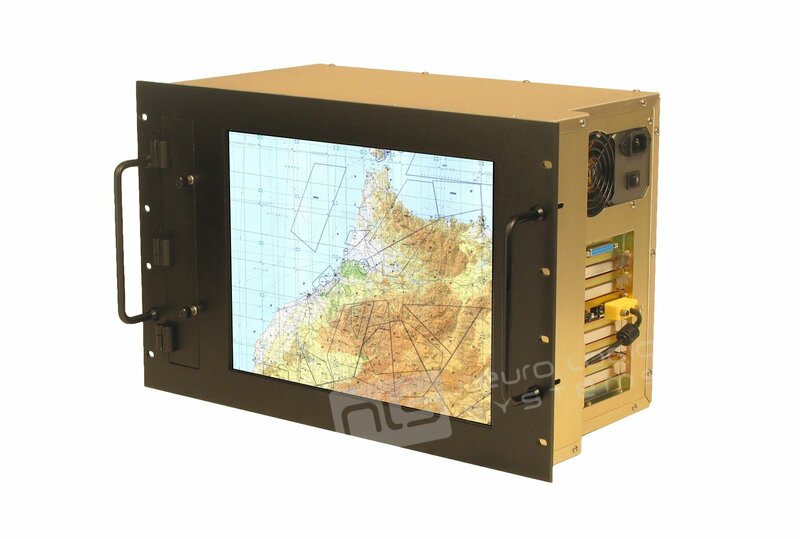 PM-30 touchscreen display is presently undergoing qualification for deployment on Scandinavian military ground vehicle and airborne missions and on Israeli military ground vehicles. Beginning with CRT-based displays and touchmonitors, NLS rackmount units were engineered with the necessary ruggedness to ensure reliable operation on factory floors and harsh environments, such as including silicon wafer fabrication, PCB drilling, cement and lumber mill plant operations and outdoor amusement ride control. NLS rackmount CRTs were deployed by NASA in the Johnson Mission Control Center as well as in the Kennedy and Vandenberg Launch Control Centers. Customer Need: Textron required a rugged rackmount backplane computer solution for a shipboard installation. It had to fit within a tight physical outline without sacrificing the standard features and peripheral components in much larger conventional designs. Operator control was to be via touchscreen and the entire front panel had to be IP65/NEMA4 sealed to avoid damage by corrosive aircraft hydraulic fluids while still providing access to the floppy and CD drives, Serial I/O ports and operator controls. Starting with a standard 15″ rackmount display, NLS enlarged the chassis to add a 6-slot ISA computer backplane. We positioned the operator accessible peripherals, I/O connectors and controls behind a gasket-sealed access door and we installed the power supply, hard drive and other internal components and electronics in locations chosen to preserve the required compact physical outline of the enclosure. Today our RW-15 workstation computer with its IP65 sealed 15″ touchmonitor display and front panel access door is deployed fleet-wide on aircraft carriers for servicing F-16 and F-18 naval fighter jets.